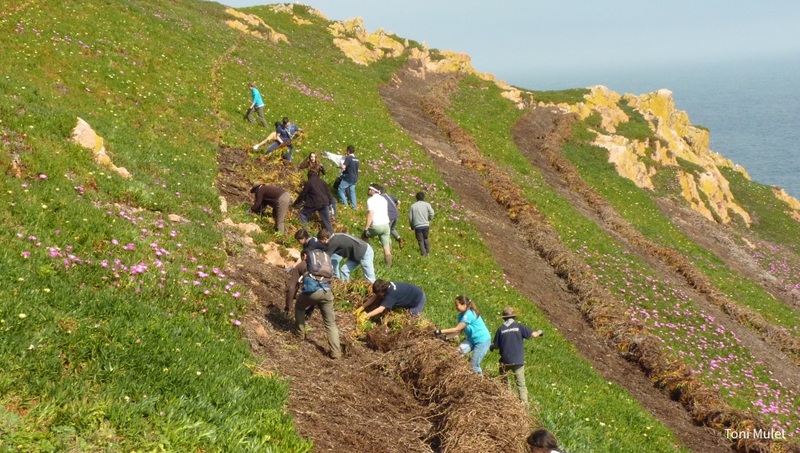 Spend a different week in Berlengas and join the volunteers’ team who makes a significant contribution to the project carrying out several activities. For more information about the SPEA Volunteering Programe please check the SPEA website! Alessandro Marraccini, Ana Carolina Barreiros, Ana Catarina Duarte, Ana Coelho, Ana Luísa Amaro, Ana Ruas, Ana Santos, Ana Santos Torres, André Pinto, Andrea Ripol, Andreia Chora Filipe, Anita Alessandrini, António Paredes, António Vulcano, Bárbara Freitas, Bárbara Gama, Bea Morenza, Beatriz Cardoso, Brigita Simunac, Carlos Tejada, Carolina Barreiros, Catarina Carvalho, Catarina Galego, Cátia Barbosa, Cláudia Pereira, Cláudia Pich, Daniel Lopes, David Gomes, Débora Marujo, Diana Porto, Eliana Sales, Elisabete Silva, Emília Santos, Ewa Kozlowska, Fábio Santos, Filipa Soares, Filipe Moniz, Henry Brown, Iara Ferreira, Inês Brilha, Inês Coutinho, Inês Ferreira, Inês Franco, Inês Gama, Inês Martins, Inês Morão, Irene Tolu, Isabel Fortes Rodrigues, Isabelle Bellier, Iván Gutiérrez, Iván Kljun, Jesus Martínez, Joana Ramírez, Joana Romero, Joana Rosa, João Paredes, João Pereira, Karolina Mikslová, Leonardo Ricardo, Luís Ferreira, Luísa Crisóstomo, Luísa Teixeira, Manuel Quaresma, Margarida Monteiro, Maria Carballo, Mariana Anjos, Marina Bollo Palacios, Marta Catita, Marta Mancini, Max Hoppe, Miguel Duarte, Miguel Grilo, Miguel Guedes, Monika Szynaka, Nuno Espírito Santo, Patrícia del Peso, Penélope Fialas, Rafael Rocha, Rita Matos, Rodolfo Ramos, Rúben Tarifa Múrcia, Sara Riso, Sara Soares, Simão Maia, Tânia Cale, Tânia Nascimento, Tiago Dias e Toni Mulet. Any person or company may contribute with donations to develop this project and to ensure the work after the co-financing from the European Commission ends. Any contribution to SPEA will always be welcome, appreciated and recognized. Your support is important for this and other SPEA conservation projects. Discover how! My participation in the Project LIFE Berlengas was something completely new for me and exceeded all my expectations. It has been an experience that allowed me to learn more about one particular subject of marine biology that I barely knew which I loved and I’m sure it will be very useful in my future career. In addition, the work environment in the field station was relaxed and friendly allowing me to get to know more about the Portuguese culture through its people. I want to thank SPEA for accepting my participation in this project which, no doubt, I would like to repeat. My internship with SPEA started in September 2014, through the European program Leonardo Da Vinci and, from the start, it was a “deep dive” in the world of bird´s conservation, particularly seabirds. In the last couple of months I had the opportunity to help with different tasks that were taking place in Berlengas archipelago under the framework of the LIFE Berlengas project. My trip to Berlengas allowed me to connect with nature, with its rich biodiversity and with the lovely people from the island. It was an incredible and rewarding experience, both professionally and personally. Finally I would like to thank the entire team of SPEA for welcoming so warmly and for making me feel part of a big family. Last year, in September, I had the opportunity to go for a week to Berlengas Island as a volunteer with SPEA. At this point, the project LIFE Berlengas had just begun. This first phase of a project is always very interesting to get an idea of the amount of work involved “behind the scenes”. I have been helping with the ship rat captures and with the first phase of the hottentot fig clearance. Not only I learned a lot with the team, but I also enjoyed every day in this beautiful archipelago and in the company of the Nature wardens. At the time, there was also a research team from IMAR Institute (from the University of Coimbra) working in the island with the Cory shearwaters. The fieldwork took place during the night, and at this summer time, the colonies are certainly an unforgettable sight and atmosphere. But my favorite day was spent on the Farilhões Islets: a sense of freedom, accompanied by the wind and band-rumped storm-petrels added an inestimable value to a visit to these small oceanic islands. The best way to get to know Berlengas is as a volunteer, giving a hand to nature and enjoying at the same time. During my internship at SPEA, under the Erasmus program, which took place between January and July 2015, I have been three times in Berlengas. My first trip to the island was in a rubber dinghy with waves of 3 meters, which was quite impressive! The archipelago seemed spectacular seen from the sea. When I reached the pier I was warmly received by all: nature wardens, lighthouse keepers, fishermen and the members of SPEA team. In general there is a helpful and friendly atmosphere among all the people who work on the island. The work plan was diverse and very interesting including monitoring different species of fauna and flora, ringing and tagging of mammals and bird species, habitat restoration by removing the hottentot fig between others. During my free time, I enjoyed the natural beauty of the island and I had fun playing volleyball, table tennis or cards, I really enjoyed my time in the island and the company of my colleagues. I wish all the success for the conservation work in Berlengas in order to protect this unique place. I hope and look forward to come back one day. My work with SPEA started in September 2014, through a curricular internship under the Marine Biology and Conservation Master from ISPA University. The internship was short, and now I believe I should have chosen a longer one. Nevertheless, the experience was very rewarding since I came across with new work methodologies; different from the ones I was more familiarized. During the time I was in the Berlengas archipelago I came across a “world” where technology is not a constant and where most mobile phones have little or no connection at all. I believe this makes the experience even more enriching since the lack of communication with the outside world promotes the connection and mutual help between people and contributes for an excellent team work. The routine is not determined by the clock compass, but by the willingness and motivation to do the best you can; whenever a team finishes its work, tries to help the other team, prevailing a good atmosphere and the will to do the job well done, instead of any kind of competition. I think these are the features that distinguish SPEA from other organizations. To do an internship with SPEA is to be part of a family that welcomes us and that makes us see the world in a different ways; and that makes us believe that is possible to protect our natural resources and promote an healthy environment not only for humans but for all species. Over the past five years, I have been involved in several tasks as a volunteer in SPEA, mainly bird census. As I wanted to widen my participation and extend it to conservation projects, I could not miss out on the opportunity to be a volunteer in the Life + Berlengas Project for a week. And it was, certainly, the right decision! The tasks carried out during the week included Cory shearwater nest monitoring, rats and rabbits population monitoring, seabird census and hottentot fig removal. It was a very busy schedule, but always with some time to enjoy the Berlenga island natural beauty, as well as for socializing. It was a very productive week, full of learning and teamwork. Above all, I could feel that I was making a contribution, even if small, an essential contribution for a large scale project. It was a unique experience and I certainly look forward to repeat! Before I saw it only in some movies, but in Berlengas it was real! The night shift of Cory shearwaters chicks control will stay in my mind I hope forever. Ana and I went to the nesting place of shearwaters at around midnight. It was very dark and very windy that night. It was my first time to go there at night, and, I have to admit, I was a bit scarred. But when we reached the place, I forgot about all my fears. Some of the adult birds were sitting on the rocks near the nests; others were inside together with their chicks. It was an unforgettable experience to walk among them, to touch the free, wild birds. While I was measuring one of the little shearwaters, probably its mother or father was sitting just next to me. A bit like in a paradise, where animals were not afraid of people. But not only the birds will I keep in my mind. I was very touched by the hospitality of SPEA staff and the people working on Berlengas. Thanks a lot for the best of the Portuguese kitchen that we could taste every day. And thanks for teaching me your language. Muito obrigada! I've been volunteering for SPEA ever since I've met this organization back in 2014. I've volunteered at Berlengas and, more recently, did a curricular internship, about fisheries, inserted in the LIFE Berlengas Project. This internship consisted in the observation of fisheries and accidental capture of marine birds aboard the commercial fishing vessels of Peniche, as well as the experimentation of new mitigation methods aboard said vessels. Some marine birds censuses were also performed. An opportunity to do part of this internship aboard one of the IPMA vessels, the NI Noruega, came up and I didn't hesitate to confirm my presence. Being at sea is not an easy task, even more so when one spends so much time without stepping on land. And, as the saying goes, "one day at sea is like a week on land". However, for those who love the ocean, it's a lot easier. And, of course, the help of IPMA's team as well as the fishermen's crew, made the stay a lot easier too. In each of the 19 days spent aboard, censuses of marine birds and fishing observation were made. I've also spent some time in SPEA's headquarters inserting the aforementioned observation data into a database. Moreover, while I was there, I did an identification guide for the use of other fisheries observators. Whithout a doubt, this internship contributed not only for my cognitive knowledge, but as well as for my personal one. When you do what you love, time really does fly by. And one thing is for sure, each experience that you have with SPEA is a learning moment, either done alone or as part of a team. Thank you and see you soon SPEA!